This week Josh, Annie, and I have begun wrapping up our final project which we will be presenting tomorrow. 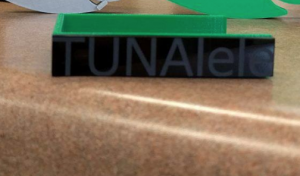 The Tunalele actually works! After many weeks of stressing out over how difficult this would be to execute, we finally have a working product. Josh and I were still focusing on the design this week while Annie (with the help of Colton from the FabLab) took care of the Arduino coding. Our final pictures will be displayed in the presentation tomorrow but here is a sneak peak of the rastered Arduino casing: . Josh and I wanted to incorporate multiple aspects into the design to show off our skills we learned this semester, this being the reason for the rastering of the side. That, and it looks pretty cool 🙂 We also had to make a change to the fish head so that it would fit on the tuning peg without breaking it so we made some edits in Fusion and re-printed the new piece. During the week we found a major setback in the code. It was written to only pick up electric frequencies, not acoustic, so it would work with a guitar amp but not an acoustic ukulele. Luckily, Colton and Annie found a quick fix to this by adjusting the microphone and the frequencies it would be able to pick up. We were worried for a while that we would have to find an electric ukulele to work with our tuner but they saved the day. While this project was very difficult to complete I am so glad I had such an awesome team to work with. Annie, Josh, and Colton were amazing and we definitely could not have a finished product for tomorrow without all of their help. Can’t wait to present it to you all in class! I think this product is really cool! I am trying to learn how to play, and I think this would be a great product to have! Keep up the great work!